What would I grab if my house was on fire? I think like a lot of people, I had thought about what I would do if I ever had a house fire. I thought about what I would grab on my way out. I think like a lot of people, the amount of time I imagined I would have to salvage things would be lengthy, that maybe I could make multiple trips for all the things I couldn't grab in one armful. I thought I was prepared. I always kept my purse and keys on the kitchen table. I theorized that in an emergency I would need those and if they were in the same spot next to the back door I could easily grab them in a hurry. We had an emergency escape ladder for the upstairs bedroom window so that my kids would have a second route out from their rooms upstairs. We had a designated meeting point in case of evacuation. I thought we were prepared, but didn't really think we needed to be because I somehow thought the odds were on our side. It was one of those things that happen to someone else. I never thought that someday *we* would be the someone else. I mean what are the odds? As a 9-1-1 dispatcher I had taken plenty of calls for house fires. I even dispatched units to a co-worker's house when it was on fire. When my co-worker's fire happened I remember actually saying that I was safe because what were the odds of it happening to two people so close? Less than one year later, on August 15, 2006 I found out I was wrong. I was on night shift and was trying to sleep during the day. My daughter who was in high school had taken my two year old daughter and the dog for a walk. As she came back in the house through the back door, she discovered the house full of smoke. I remember waking to her voice, stern and authoritative saying "Mom, you need to get up, the house is full of smoke". I heard her call to my son who was in the basement playing video games. He said later that he smelled the smoke but thought it was outside. He planned on checking it out when he got to a safe spot in his game. I too remember smelling the smoke as I tried to sleep. I remember wondering why a neighbor would be outside burning leaves during the hot dry month of August. I remember rubbing my eyes thinking that my eyes were foggy from being sleepy. It didn't take long before I realized that it wasn't sleepy eyes that was keeping me from seeing, that it was smoke. The main level of the house was so smokey it was hard to see. I knew I needed call 9-1-1 right away. Unfortunately, I had left the cordless phone laying somewhere in another room. When I finally found it I went out the back door and called and reported my house was full of smoke. 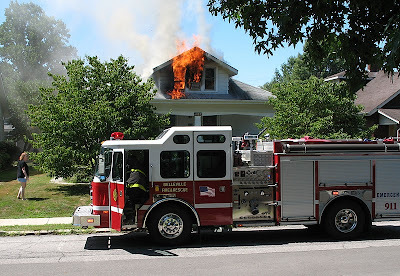 I called my husband who was on duty (he is a police officer in a nearby town) and told him the house was full of smoke and that I had called the fire department. Instantly a neighbor was by my side and whisked the kids and dog away to her house through the back yard. I am thankful for that because they never saw anything more than smoke. I think the realization hadn't really hit me. It was smoke, something in the house was smoking. I didn't connect that smoke meant fire. I walked around to the front of my house where the fire trucks would be arriving and was hit by a ton of bricks. The whole upstairs of my house was on fire. Fire, not just smoke, but fire, whipping and roaring fire. I stood there in my front yard barefoot in my shorty short sleeping shorts clutching my cordless phone in total shock. Thankfully I live in a community that has a full-time fully staffed fire department that is only about 5 blocks from my house. They were literally on scene at my house within two minutes of the dispatch. In the moment, two minutes feels like a million. I credit the fast response with saving our home. They were able to limit the actual fire to the upstairs. Unfortunately, because of smoke and water, our entire house ended up being about 75% rebuilt. My teenage daughter and son, whose rooms were upstairs, lost everything. All of our family photos and special mementos, the things most people say they would save first were spared since they were in storage containers in a cabinet in the basement. They were protected from both smoke and water. Some of the things I learned in all of this is that while you may think some things are priorities and are things you would go to in an emergency, you won't. You may think you are prepared and have a plan, but you will never be fully prepared. The "things" that you think you can't replace, you discover that they aren't that important after all. Stuff is just stuff. I always thought I would grab my purse and keys but instead I walked right past them. I thought I was prepared because I had a fire ladder and a meeting point, but carelessly left my phone laying randomly around the house and couldn't find it when it mattered most. When the fire happened I went out the door without my purse, my keys, and even shoes. I didn't stop and think for even one second about photos or possessions. What I thought about was my kids, our dog, and getting help. As I stood and watched my house burn, the "stuff" didn't even cross my mind. In the days that followed there was some mourning over stuff, but the mourning only lasted for a moment here and there. All it took to put it in perspective was the mental image of my daughter's burned out mattress laying in the front yard. Our fire was the result of an electrical short in a wall outlet. The outlet was next to her bed and under her window, the very window that the fire ladder would have to go out. If this fire had happened at a different time of day, our story would have been so very different. It is that realization that puts it all in perspective. I am a changed person because of the experience. I still keep my purse and keys on the table by the back door because I still think that it is important to have them there. I always make sure that the phone is in the charger which near the door. When I put on my sleeping clothes I keep my day's clothes and shoes on the floor next to my bed. I don't intend to ever be photographed by a neighbor in my shorty short sleeping shorts ever again. I keep special things like photos in storage tubs in the front coat closet. I won't be grabbing them in an emergency, but they are together in one spot and easily removed if I ever find myself in recovery mode again. I still get a sick feeling in my stomach when I smell something burning. I suspect I always will. In those moments when I am frustrated about problems with our home due to a bad contractor, I stop and think about that image of the mattress. It reminds me how quickly life can change and to be grateful for life. Stuff is just stuff and life is life. I hope you have enjoyed reading the Burning House posts this week as much as I have. A huge thanks to all of the contributors to the posts and a special thank you to Tammy for her final story. I feel as if I have gotten to know each of you a little bit better. I also hope that we can look at Foster Huntington's work as a catalyst to take a hard look at what we bring into our homes and what we really value in our lives. Thanks for posting this story... It hit me so on a self pity day,and I am so thank-full that you,and your family were safe.. God works in great ways,and by you sharing your story it has changed my life.. Thank you...I too had a brother who lost all to a fire,and also when he was little before I was born he was in a house fire.. Makes me love him more.. god bless you.. Thanks Paula for sharing all of these stories and images this week! It has been interesting to see what everyone treasures (beyond family and pets). One thing I didn't mention in my post: I have photographed and scanned all of my treasured items (still working on all the old photos), and have those photos backed up on DVD's that are stored in 3 separate houses. So hopefully if I do ever lose my 'stuff' I still have a record somewhere. Reading Tammy's post reminds us that it really could happen to anyone at anytime. Thank goodness her family were all safe. Thanks again Paula for all of the posts this week!